The CMA CGM Group is pleased to announce the christening of the world’s largest containership, the CMA CGM MARCO POLO (16 000 TEU), today at the Container Terminal of Zeebrugge, in presence of her godmother, Mrs. Naila Saadé, President of the CMA CGM Corporate Foundation and wife of Mr. Jacques R. Saadé, CMA CGM Group Chairman and Chief Executive Officer . For this event, will be present on board, Mr Jacques R. Saadé, CMA CGM Group Chairman and Chief Executive Officer, Mrs Hilde Crevits, Minister for Social Mobility and Public Work, Mr Karl Decaluwe, Governor, and Mr Joachim Coens, President of the Port of Zeebrugge. 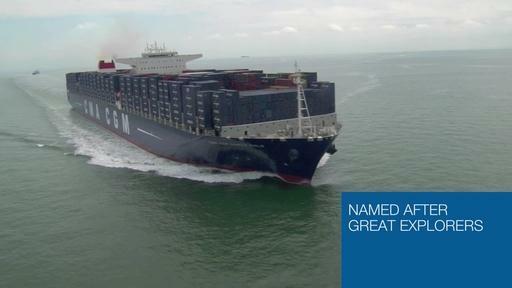 Symbol of the pioneer spirit of the CMA CGM Group inspired by Jacques R. Saadé, the new 16 000 TEU vessel sails under the UK flag.